Middle East: What Can Cinema Do? presented 50 films for a viewing-packed week. Documentaries were in the majority, proving that the political and economic woes of the region have not stifled the filmmakers, but rather encouraged them to speak up. 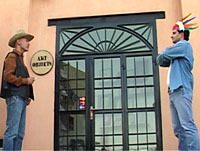 Half the films were features; ten shorts and the rest were mid-length works. Works by these Middle Eastern film directors were complemented by a certain number of films by European and American directors, notably from Switzerland, Spain, France, the USA and Mexico. All the films presented at the event, in alphabetical order, are available below for you to discover. As part of the American "Shock and Awe" campaign, a Baghdad Mental Hospital is bombed, resulting in the death of many of the patients and staff. To escape their fear and confusion many patients have fled into the chaos that is now engulfing Baghdad. Among them, Ahlaam, confined to the mental institute after witnessing the violent arrest of her groom on their wedding day. Young doctor Mehdi, the only doctor to survive the bombing, with the help of nurses, and another patient Ali, begins the dangerous task of searching Baghdad for missing patients. Ramallah, capital of the Palestinian Authority during a period of transition, after the death of Yasser Arafat, awaiting the next elections. 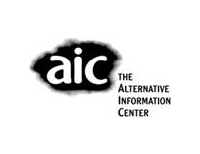 The Alternative Information Center (AIC) is an internationally oriented, progressive, joint Palestianian-Israeli activist organization. I tis engaged in dissemination of information, political advocacy, grassroots activism and critical analysis of the Palestinian and Israeli societies as well as the Palestinian-Israeli conflict. Who said that enemies do not communicate in times of war? In fact, violence, deception, and fear of the other are the only tools of communication between two struggling sides. 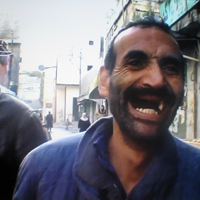 Always Look them in the Eyes is a documentary film that examines Palestinian forms of communication with Israelis. It does so by highlighting a story of an Israeli spy, called the Featherman, who in the seventies roamed the streets of Beirut pretending to be mad. By living among Palestinians and Lebanese, the Featherman broke a major war rule which forbids spoken communication in times of conflict. 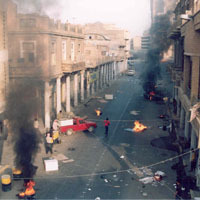 On the road in Lebanon during the summer of 2006 when the 33-day war broke out, the director left France with a French delegation supporting the Lebanese resistance and at first gives us an eyewitness look at what happened as seen by the people encountered while the bombs were falling on Beirut.